TV show dates: January 6, 2017 — February 8, 2019. Performers include: Justina Machado, Rita Moreno, Isabella Gomez, Marcel Ruiz, Todd Grinnell, Stephen Tobolowsky, Eric Nenninger, Ed Quinn, Fiona Gubelmann, Ariela Barer, and Froy Gutierrez. 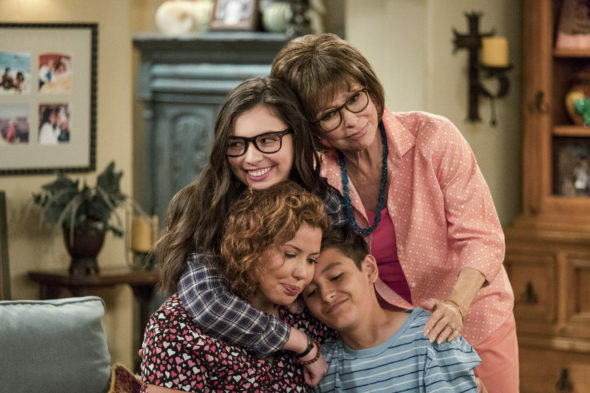 A family sitcom, the One Day at a Time TV show is a reboot of the original Norman Lear series starring Bonnie Franklin, Valerie Bertinelli, MacKenzie Philips, and Pat Harrington, Jr., which ran on CBS from 1975 to 1984. In the updated comedy, the story follows divorced mother Penelope Riera Alverez (Machado) and her family. A Cuban-American woman, Penelope is a US Army veteran, who now works as a nurse, for Dr. Leslie Berkowitz (Tobolowsky). She is once again trying to figure out life as a single woman, but this time, she’s doing so while raising two children. Penelope’s first born is her daughter, Elena (Gomez). This teen has strong opinions about the world and is something of an activist. Meanwhile, son Alex (Ruiz) is a socially successful young man, with some conceited tendencies. Penelope doesn’t have to do it all on her own. Her Cuban-born mother, Lydia (Moreno), is there to lend a hand and share her opinions, even when they haven’t been solicited. Likewise, building manager Dwayne Schneider (Grinnell), is something of a “friend without benefits” and Penelope’s confidant. The comedy touches on many of the same themes as the CBS original, but from a modern point of view. And through good times and bad, this gang is a reminder that family and friends are what life is truly all about. First aired: February 8, 2019. What do you think? Do you like the One Day at a Time TV series? Should this TV show have been cancelled or renewed for a fourth season on Netflix? I loved this show. It always made me laugh and I feel that it has so many more positive messages to convey to its audience, which is why I do not want it to be cancelled. Love this show. I watched the original as a kid. Now I have watched this one with my children. Hysterical, life lessons. Dont cancel! Please do not cancel. I grew up watching the original and must say that I love the new version and it is amazing to watch with my daughter. The only show that I have watched that feels real and true to life. I cry and laugh so much and its amazing. Every single eoisode has such power and I am amazed how many feeling I express in one episode. Keep the episodes coming please. This show has everything you could ask for from the actors and writers and storyline. Don’t Cancel. Love this show, in different situation it has hit home. Please do not cancel! This is one show that can be watched as a family and deals with current issues that are not always easy to discuss. We all love this show!!! Do not cancel. I love this show. No it should not be canceled! One of the best shows I have seen since “how I met your mother”. Albeit not a huge cast but the show captivates you with what they have and it’s amazing. There’s good time and bad times, I absolutely love this show.